As I said before, food has been pretty lazy around here. All the running around between offices, doctors appointments and schools has left life in the kitchen pretty close to nonexistent. Sometimes, prepared foods are the best way to go! Luckily, we went to Trader Joe's a couple of weeks ago and stocked up on some new stuff! So, even though we did not prepare some of the things, we did find some new things that we love! We have been eating a lot of cereals, omelets and sandwiches and those aren't really things to blog about. Although, this one is definitely one to speak of! 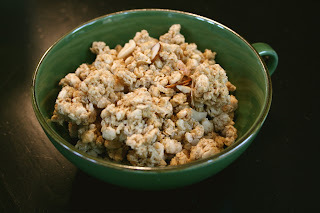 If you love ginger, you will love this cereal! It is literally bursting with ginger flavor! It tastes like granola and ginger snaps all mixed in one. I had it on a little oatmeal last night for dessert too! It is so yummy! I think it would be great as a pie crust or in granola cookies. I see some possibilities for more of this cereal in the near future! 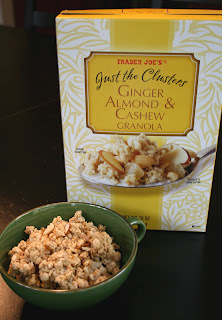 I just wanted to show you that you can actually see the chunks ginger, almonds and cashews in this cereal! Here is Maggie (the queen of the house) in her domain. She is totally relaxed and loving the cooler morning temperature today! Also, did you know that most animals are lactose intolerant? Here is a link for you to check out with some information on lactose intolerance. It is pretty interesting! We always need more corn salsa! I think Tony is going to have to go to a group soon about that problem!